Arlene Kelly wouldn’t say how big the check was — just that it was big enough to allow her and business partner Kim Sanborn to retire to the beach. And they thought about that scenario, but just for a proverbial minute or two. Not done with taking bold entrepreneurial risks — the two have helped launch several ventures — and certainly not done trying to change the face of health care administration and reducing the frustration and skyrocketing costs associated with it, she told BusinessWest. That’s what the two partners did with Healthcare Resources Solutions Inc. (HRSI), a company they started in 1996 with the intention of managing billing and other revenue-management processes for its clients. This venture, which eventually grew to 120 employees, more than 600 regional clients, and more than $250 million a year in total billing that it handled, eventually caught the eye of software maker IDX Systems Inc., which cut that large check not long before it was absorbed by massive GE Healthcare. Thus, that’s the name on the door of the space in Wilbraham’s Post Office Park into which Sanborn and Kelly moved HRSI amid a serious growth spurt three years ago. And now, the two partners are back in the space they started in over a decade ago, just a few hundred feet away in another office building within Post Office Park. The name on their mailbox is now Convergent Solutions Inc. (CSI), a company that Kelly and Sanborn expect will go much further in their efforts to make a serious dent in a statistic they quote often: that 35 cents of every dollar spent on health care goes to administrative processes. Summing up CSI, Kelly said it was created to help physician practices large and small (down to individual physicians) take “subjectivity” out of medical billing and other administrative processes through a suite of products under the brand name Visum (Latin for ‘understand’). Elaborating, Sanborn said this subjectivity (a word both partners would use often) occurs essentially whenever there is human involvement with information and the processing of it. To clear the minefield, Sanborn, Kelly, and fellow CSI partners Craig Coffey and Edward Authier have, after more than a year of extensive research and development, created a system that uses artificial intelligence and business process management (BPM) software (which is new to health care but has been used in other sectors for years) to remove large doses of that subjectivity, thus reducing errors, enhancing revenues, and ultimately allowing physicians to focus on health care, not revenues and billing. “The key word in the company’s name is ‘Convergent’ — this is the convergence of people, process, and technology,” Kelly explained, adding that the CSI product, or service, as they prefer to call it, begins with the physician’s office. And essentially, it takes the emerging technology known as electronic medical record, or EMR, and makes it less error-prone, more accessible, and more affordable. CSI, which opened its doors in January with a series of BPM and EMR practice-management products, is ready to launch an ambitious new offering that essentially interprets physician dictation and advances the process straight to the billing of a claim, thus eliminating several steps involving that aforementioned subjectivity. The company is hiring a wide array of professionals, and could have a staff of 150 or more within a few years. In this issue, BusinessWest explains how a year not spent in the sun led to what many expect to be a key breakthough in the health care industry. As she went about the elaborate process of explaining just what CSI is and how it will ultimately go about changing how business is done in health care, Kelly started by talking about HRSI — and tonsils. This is just one of many challenges facing physicians and physician groups in the information age, and to help such businesses overcome them, Kelly and Sanborn created HRSI, a company to which physician practices outsource medical billing and other revenue-related procedures, thus enabling them to ultimately reduce errors as well as what are known as AR (accounts receivable) days — the time between when a bill is submitted and when it is paid. In a nutshell, what HRSI did was make a sophisticated (and expensive) software program made by IDX available to smaller physician groups that otherwise couldn’t afford it. As IDX continued to lose clients and revenue to outsource companies like HRSI, it started looking into how these outfits operated — only, in the case of HRSI, it did much more than look. “They scheduled a meeting, listened to us for about a half-hour, and then said, ‘we’d just like to buy you,’” said Kelly. “They just threw an offer on the table … it was unbelievable. “We weren’t expecting this at all,” she continued, adding that what ensued was a six-month-long review period during which IDX examined HRSI’s operations to see if they were in compliance with the myriad regulations governing this industry, and if it was, indeed, a good fit. “They came away thoroughly impressed,” said Sanborn, adding that, as the negotiations continued, it was announced that IDX was being acquired by GE, which knew about the HRSI deal, gave its blessing to it, and completed its transaction of IDX two months later. For the next year, Sanborn and Kelly watched as their small company was assimilated into a huge corporation, and pondered their own future. The status quo — meaning work for GE Healthcare in a management role — and the beach were always options, but as they observed GE’s absorption of their company, the partners also observed many other things, and envisioned some different career alternatives. For starters, they recognized that the model they had created with HRSI didn’t work nearly as well in an environment where volume increased exponentially. Meanwhile, they also observed that, despite improvements born from new technology, there was still far too much subjectivity — meaning too many manual processes remaining — in the realm of health care billing, and that there were certainly some business opportunities available to those who could find some ways to reduce or eliminate it. Recognizing this, and the fact that the operating environment within GE Healthcare wasn’t for them, Kelly and Sanborn also understood that they weren’t ready for the beach, and also had too much to offer the health care industry to walk away from it. “GE was a great place to work — they paid us very well to stay on,” said Kelly. “But it just wasn’t what we wanted to do; it was very difficult for us to stay in that environment, running a business one way as we did for all those years and then have a major corporation come in and change the philosophy. For the next year or so (the length of their non-compete agreement with GE Healthcare), the four partners — Coffey and Authier had worked with Kelly and Sanborn for years — traveled across the country and, ultimately, over the Big Pond, to create what they fully expect will be the next big thing in the outsourcing of medical billing and other revenue-management processes. As they embarked on their search for technology that would help them achieve their stated goals, Sanborn and Kelly were guided by one overriding question — ‘what can we do to improve the situation in health care?’ — and to answer it, they made broad use of what could be called the ‘perfect-world’ approach to research and development. “That’s what we kept saying to each other,” said Kelly, adding that the intellectual discussion starts with what happens just after a physician provides a clinical service, “because that’s where the problems start. Elaborating, she said, in the current, far-less-perfect world, most physicians document their clinical service, essentially detailing what they did for the patient in question. This information is then reviewed by someone else at the office to ensure that everything was crossed off correctly, and then goes to an internal coder, a person trained to do coding, then on to someone in data entry, and finally out the door to the insurance company in the form of a claim. In other words, there is far too much room for error in this scenario, said Sanborn, adding that CSI was created to take much of that room out of the picture. “So we said, ‘OK, how do we get from clinical documentation to the claim going out the door without any manual intervention,” said Sanborn, noting that the search for the answer would take them from Boston to Belgium, amid a host of other places, and heavily involve the technical expertise possessed by Authier, CSI’s chief technology officer, and Coffey, the company’s chief operating officer. Condensing the details of that search, Kelly and Sanborn said it boiled down to bringing together business-process-management software with technology that involves natural-language processing, or, in this case, taking physicians’ dictations and converting them into codes for billing purposes. BPM, used in many financial-services sectors, essentially creates rules that can’t be broken, said Sanborn, adding these rules essentially make a system “bulletproof,” thus preventing expensive errors. Insurance companies have had such software for years, she said, adding that CSI wanted to put it in the hands of those at the other end of claims — the physicians. Those at CSI worked to essentially plug BPM into EMR in an effort to cut down on errors involving both under- and overpayment of claims that result from simple human error. The problem with taking such human subjectivity (there’s that word again) out of the equation — and it was a big problem — is that EMR involves mostly physicians’ dictation, or what is known as ‘unstructured text.’ For CSI to even approach its ‘perfect world’ scenario, it would need a technology that could read unstructured text, or free-text data, and thus extract the information from it and code it for billing purposes. CSI is doing so with a product that Language and Computing originally designed for the homeland-security industry. In a nutshell, that program was created to hear and interpret words in many different languages. The partners at CSI saw the technology in use and thought it could also be used to understand physician dictation. 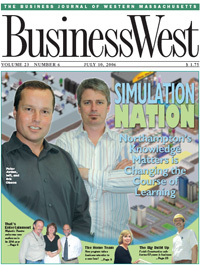 Kelly and Sanborn told BusinessWest that they have brought the pieces to the puzzle together, have test-driven it, and know it works. Now, the work shifts from R&D (although that will always be ongoing) to sales and operations. They expect to launch their natural-language-processing product by midsummer and, in the meantime, are putting their EMR and practice-management systems into the hands of many physicians and physician groups that don’t use it because they don’t think they can afford it. Cleaning up the mess is what Kelly and Sanborn first set out to do 12 years ago with HRSI, and now they’re taking it to a higher — make that much higher — level. All joking aside, Kelly said she and Sanborn never really considered the beach as their next stop after HRSI. As she said, they consider themselves too young for retirement, too entrepreneurial to be happy working for someone else, and far too invested in driving down the cost of health care to sit on the sidelines when the system is still considerably flawed. But most of all, they have the experience and the know-how, and, as Kelly said, that would be a terrible thing to waste.